Barcelona's run to the top of the La Liga table had to happen. A faltering and out-of-form Real Madrid helped the Catalan club's cause. On Saturday Los Blancos lost to 10th place Athletic Bilbao 0-1 and stayed on 61 points. Come Sunday, Barcelona plundered Rayo Vallecano 6-1 and moved to the top of the table with 62 points to their credit. The match will be remembered for Lionel Messi's hat-trick, which is the 32nd in his illustrious career in Spain. No other player in Spanish club history has attained this feat and he betters those of the likes of Telmo Zarra (31), Alfredo Di Stefano (28) and bitter Real Madrid rival Cristiano Ronaldo (27). Messi's break-up of his 32 hat-tricks is 24 in La Liga, 2 in the Copa Del Rey, 1 in the Spanish Supercup and as many as five in the UEFA Champions League, which again is a record in itself. Amazingly, it's also Messi's sixth consecutive season of 40-plus goal hauls. After yesterday's clash with Roya his tally stood at 41 goals from 38 games, which equals the number of times he found the net last year. But that was from 46 games, a performance the Argentine considers among his worst. In contrast to Real Madrid who are struggling to find their feet, Barcelona are in fluid form. Playing without Neymar, who is out on suspension, the Catalans had no problems in brushing aside 12th placed Roya, banging in half a dozen goals. While a downcast Real coach Carlo Ancelotti lamented the lack of cohesion among his forwards and the dependence on a few individuals, Barca coach Luis Enrique exuded confidence saying he was elated at being at the top of the La Liga table but lent a cautionary note adding that it was important to maintain that position when the season ended in May. 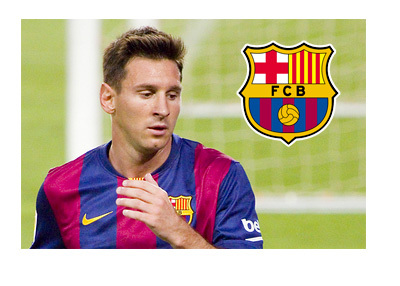 The focus now will be on the Barca's next week Champions Cup clash with Manchester City at Nou Camp. The Catalans have their tails up and seem confident of making it to the next round on the back of the two away goals at the Etihad last month. Few wager on City to pull off a miracle, what with Barca in such sublime form. At the same time few events will be looked forward to as the "El Classico" encounter, when the two Spanish giants meet at Nou Camp in a defining La Liga clash a fortnight from now. Real's attacking trio of Ronaldo, Benzema and Bale are presently trying to find the form that made them the Spanish, European and World champions last year. The midfield is in tatters. There's no support for Isco, the lone performer in that position. Toni Kroos hasn't lived up to his reputation and Luka Modric is still to recover fully from his injuries. Iker Casillas is nowhere near his best between the posts and is a pale shadow of the great that he was a couple of years ago. Real's problems make Barcelona's growing confidence even more illuminating. Messi is in the form of his life. Neymar is among goals. Suarez, who was struggling to combine as a component of the club's attacking trio has struck form suddenly. He has found the back of the net six times in the last four games and his 26 appearances for the Catalans this season have so far fetched him 13 goals. His brace against Manchester City at the Etihad was a masterclass of goal-scoring opportunism announcing that he had arrived. Real Madrid will have to come out completely from the teething problems they are faced with presently and be in full-form if they are to win the "El Classico" on March 23rd. It was as recently as October 2014 that Los Blancos had beaten Barca 3-1 in a La Liga face-off. Barcelona will be out for blood at home, there's no doubt about that. They will came hard at Real and the Madrid giant will have to do what they are best at - their famously lethal counter-attacking. A mouth-watering contest is on the cards.